Deborah is from the West Sussex/Hampshire border. She chose to study an unusual combination of both fine art and design in 2D and 3D at degree level in Bradford after working regularly with innovative designers and makers in Sussex from the age of 16. The degree included printmaking and product design. Since graduating she has worked for over thirty years as a 2D/3D museum exhibition designer on many award winning exhibitions and for many years has painted and sculpted in ceramic in her spare time. After rediscovering a passion for printmaking, she set out to focus on developing her own art practise and entered several open art competitions. 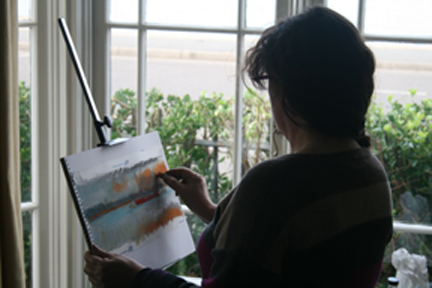 The first was the Strides Open in Chichester in Autumn 2010 when she had all three prints accepted, the second was the IOW Quay Arts Open 2010 in December 2010 when she had all three prints accepted and was awarded 2nd prize of a solo exhibition in Spring 2012. The most recent award was the Sussex Open Artists Competiton in 2013 at Pallant House, Chichester where she was awarded a Highly Commended prize. Other regular exhibitions are group exhibitions with the Chidham Art Group, Strides Open at the Oxmarket Centre of Arts, Omega printmakers in Portsmouth and Printmakers Cut, Oxmarket Centre of Arts. She is a member of the well regarded Artel artists group in Chichester, Badger Press and the Omega Printmakers, Portsmouth. The exhibition ‘Chasing Light’ at the Quay Arts Centre in Newport, Isle of Wight was a catalyst for large body of new monoprint works and they explore her relationship with the coastal landscape and record the moods and exhilaration of her time and experience there on regular holidays; the sheer elation of being on this special island, usually viewed at a distance across land and water from her home in the South Downs or Portsmouth where she works; working outside at any time of day or night and her resolve to record the developing light and changing scene revealed. Locations include Luccombe, near Shanklin, St Catherine’s lighthouse and Rocken End, Gurnard and Cowes. Deborah has been a regular visitor to the Isle of Wight since childhood where she sailed with her family who were members of the Island Sailing Club. For the last twenty five years she has enjoyed regular trips and holidays to the Island with family and friends several times a year and loves the varied coastal landscape. She makes drawings, paintings and monoprints by combining texture, color, composition, shape and line. Her current key media is the monoprint, developed from sketches made from life using pastel for colour, graphite and conte for line. Her work requires resolve, energy and stamina to rise early in the dark, setting up outside, waiting for the dawn to develop and then drawing until too tired to continue. The work is then completed in the print studio working from the sketches which enable a continuation of this process. Her visual memory is assisted from the multi-sensory outdoor experience of the surroundings at different states of night and day. Her approach to monoprint enables a simplification of the sketches and it is through this that she has developed her own visual language of mark-making and semi-abstraction. The original energy of the encounter helps to evolve the work throughout the process.